Halifax have signed the Salford prop Luke Menzies on a month-long loan deal. Menzies, who has Championship experience with Batley, Dewsbury and Hunslet, is expected to make his debut in Sunday’s Championship fixture at Dewsbury (3.0). The 27 year old will help fill the gap left by Luke Ambler’s knee ligament injury and the loss of another loanee, Jacob Fairbank, who has returned to Huddersfield. 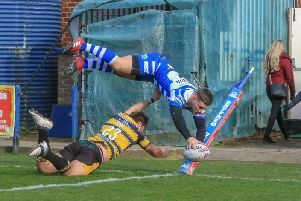 “I know about Luke and the amount of physical presence he can bring to the team,” said Fax coach Richard Marshall. “With Jacob back at Huddersfield, we had a spot open, which worked out well, both for us and Luke. “We’ve got a good relationship with Salford, who originally approached us.